Photo: File – (Left to Right) – Oromo Freedom Fighters Elemoo Qilixuu, Jaarraa Abbaa Gadaa, and Muhaammad Umar in Aden, Yemen, in 1969. The Oromo freedom fighters led by Elemoo Qilixuu participated at the foundation of the Oromo Liberation Front in Dec-Jan 1974 in Finfinnee along with leaders of the underground Macha-Tuullama youth movement, and went on to resume the armed resistance against the Abyssinian colonial forces in the highlands of Charchar, Eastern Oromia. However, the armed resistance led by Elemoo Qilixuu was short-lived due to the martyrdom of Elemoo in Sept 1974. 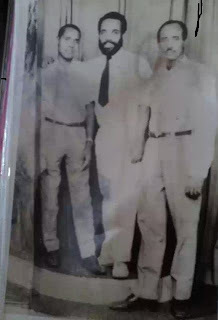 While the Oromofreedom fighters led by Jaarraa AbbaaGadaa en route to eastern Oromia were detained by the Somali government, and upon his release in 1975 from the Somali prison, Jaarraa Abbaa Gadaa joined representatives of the underground study cells of the OLF, individual Oromo nationalists andpatriots for the “Founding Congress” of the OLF in June 1976, at which pointthe 1974 draft program was revised and a new detailed political program of the Front was issued. More on the Birth of the OLF can be found on the Oromo Chronology @ Gadaa.com . ( OPride.com ) — Ibro Shaxa was killed at the battle of Ciracha during Egyptian invasion of Harar led by Rauf Pasha in 1876. He left behind a teenage son, Hamid. Unlike his father, Hamid, was poisoned by Menelik after the battle of Calanqo (1887) in which the Abyssinian army defeated Oromo fighters. Hamid, too, left his young son, Ibrahim, behind. Abdulkarim Ibrahim was born in 1936,at a time when Abyssinian feudal lords usurped Oromo lands and subjected the farmers to a life of servitude. The son of Haji Ibrahim Hamid Ibro Shaxa, Abdulkarim — better know as Jaarraa Abbaa Gadaa — was born in Eastern Oromia, near Gara Mulata, at a village of Mudir Goro,to a generation of men who have diedfighting long and hard. From an early age, in and outside of school, his peers knew Jaarraa as a respectful and humble friend. Compassionate by nature, the soft hearted Jaarraa was known for helping the needy. As he came of age, Jaarraa began seeing notable differences between the haves and have not’s, the troublemakers and thetroubled among his rural community. He soon realized that the Oromo wereseen as inferiors and relegated to second-class status on their own land. He demurred at those who attemptedto fit-in with others by accepting what was imposed on them instead of revolting against the status quo and fighting for their freedom. Wherever he went, the young Abdulkarim spoke proudly in Afan Oromo, at a time when the language was not favored. Proud of his culture and heritage, Abdulkarim began teaching others about it. After completing secondary education at the city of Harar, in Eastern Ethiopia, the suffering of Oromo people began to weigh heavily on his soul. Though he had a promising educational and political career as one of the few Oromos who completed secondary school in those days, he was most concerned with Oromo people’s freedom and dignity. At the height of his youth, Jaarraa left school and wentto Asabot, also in Eastern Oromia, to prepare for a journey that would shape the rest of his life — taking himaround the world for nearly half a century.